The perfect zip up blanket to replace loose blankets in the cot. The internal wrap mechanism keeps baby snug, maintaining their position while sleeping. 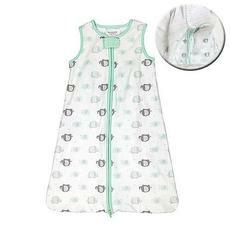 Features mesh vents and soft 100% cotton material to keep baby cozy and comfortable in all seasons. The zip also opens from the bottom for convenience with nappy changes.